The other night (on Monday, May 14th) renowned chefs from Northern and Southern California united to celebrate foie gras through fundraising dinners held simultaneously at four different venues in Los Angeles for CHEFS – Coalition for Healthy and Ethical Farming Standards in an effort to overturn the ban on foie gras soon to take effect in California. We decided to splurge and come out to the one at Melisse, and the menu and experience were absolutely incredible. With a celebrity lineup featuring Brendan Collins of Waterloo & City (easily our favorite local gastropub! ), Hiro Sone and Lissa Doumani of Terra and Ame, Raphael Lunetta of JiRaffe, Justin Wangler of Kendall Jackson, Josiah Citrin and Ken Takayama of Melisse (of course), and Mark Dommen of One Market, we knew we were in for a treat! From start to finish, it was a beautifully orchestrated dinner that truly does this decadent ingredient justice. 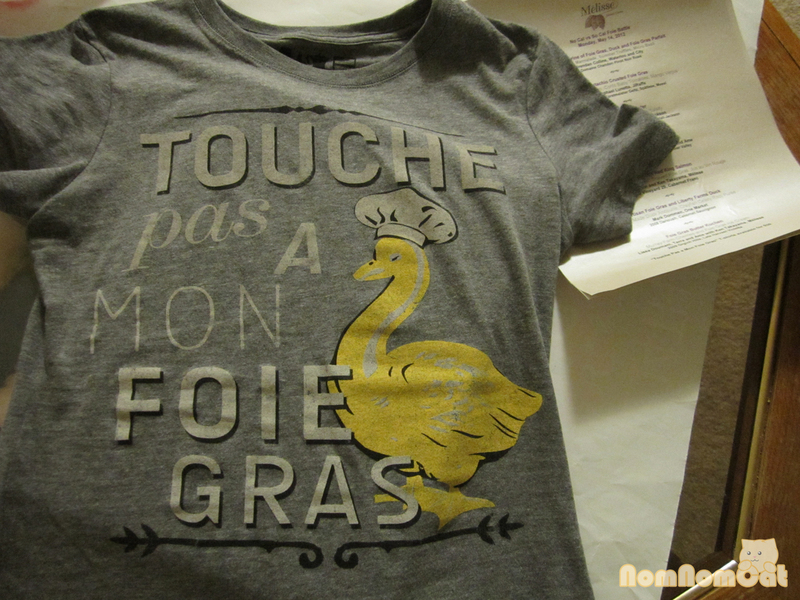 Don’t touch my foie! Alice picked up a t-shirt to commemorate the event. Amuse Bouche #2: Shot glass containing a cold gelée of fennel with a sphere of foie gras and topped with an apple-foie mousse. Served with a foie cookie for texture. Dinner started off with two amuse bouches, with my favorite being the cold foie gras. The cold foie was delicate and a great starter, also very similar in size to the foie macarons finale, but I’ll get to that later. 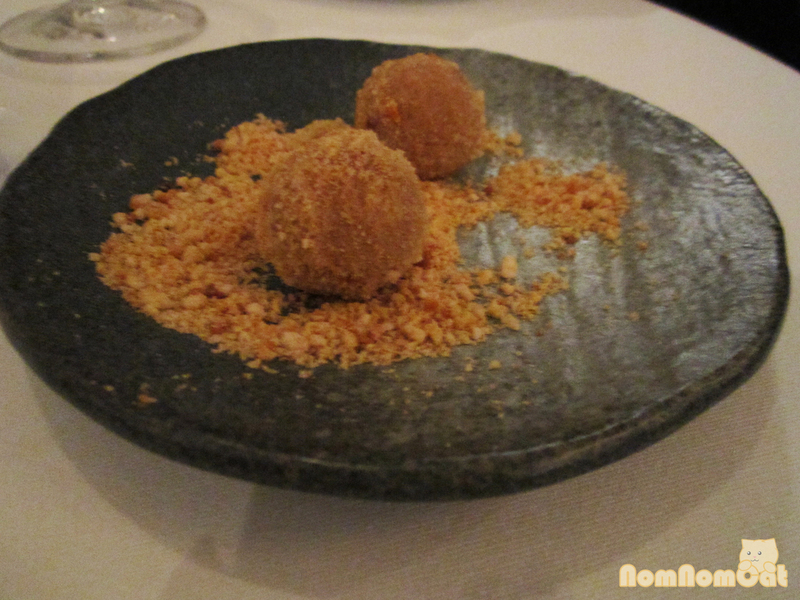 The softened foie contrasted well with its crunchy crumb coating. The shot glass was comprised of layers and while each layer tasted fine on its own, it was the combination of all three components that made it work. The foie cookie was very interesting with a center flavor oddly reminiscent of Pandan Leaf Bánh Men (a Vietnamese yeast cookie). It could very well be, since the creme was the familiar mint-green color of lá dứa. This pair was Alice’s pick from an assortment of 6 or 7 varieties. We wish we could’ve tried them all but realistically we didn’t want to fill up on bread so quickly. 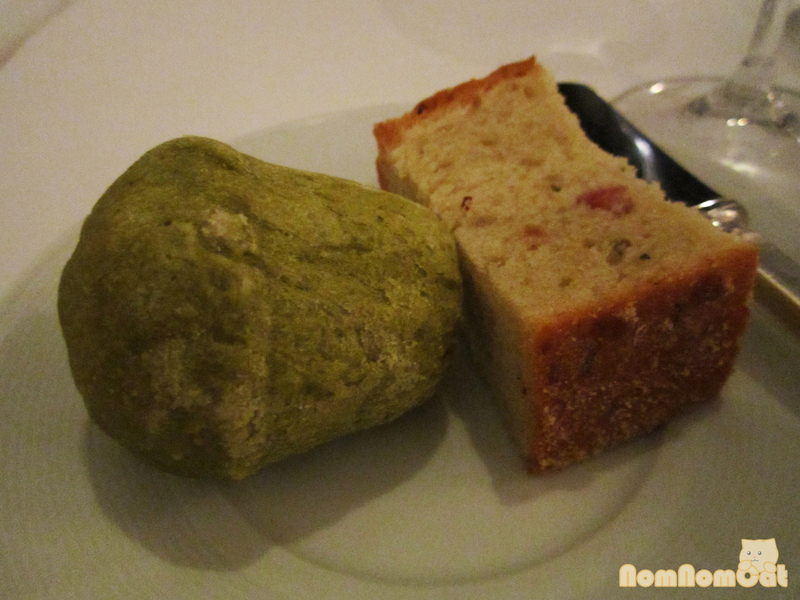 The basil brioche had a very powerful basil flavor and aroma to it but went well with a conservative scoop of butter. Alice loved how spongy and moist the center of the brioche was. The bacon focaccia was flavorful and even more amazing with a generous helping of butter. Bacon and butter, one of my favorite combinations! Very well balanced dish here and Alice’s favorite pick of the night and a close 2nd for me. Chef Brendan Collins’ of Waterloo & City prepared an orange marmalade that really helped cut the fatty foie, making the dish bright and vibrant with pieces of orange peel and bits of micro basil. Thinly sliced summer truffles helped add an earthy note to the overall dish but still allowed the foie to be the star of the show. Despite its size, it’s actually quite a bit of food when consumed in conjunction with the toasted brioche. Paired with the Pinot Noir Rosé, this dish made a very grand and vibrant entrance to begin the meal. Prepared by Chef Raphael Lunetta of Jiraffe, the second course brought its own pizazz with foie gras textured with pistachio bits. 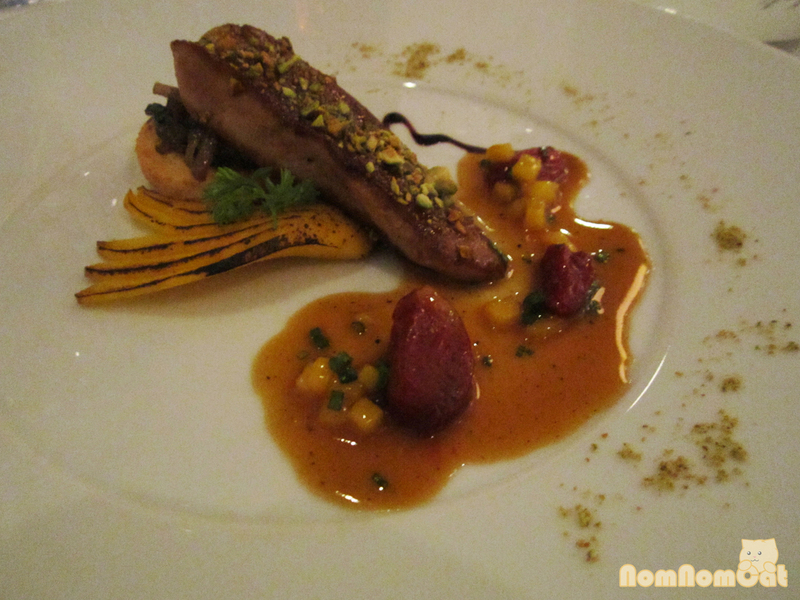 Perfectly seared foie and finely roasted pistachios gave a delightful crunch to the dish. The foie was balanced by the sweetness of the caramelized mango slices and the crispy tart topped with caramelized shallots. The confit baby tomatoes brought the acidity to complement and finished on a sweet note with the mango verjus. Unlike the previous first course, the foie here complemented the other elements rather than running away with the spotlight. 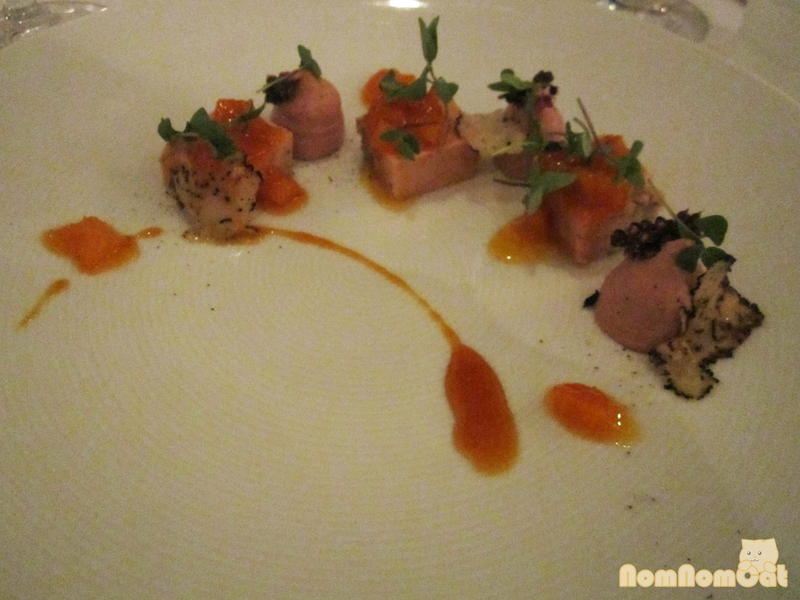 When paired with the late harvest Riesling, this course provided a nice sweet balance to the foie. I was extremely excited to get to the third course, prepared by Chef Justin Wrangler of Kendall Jackson. Unfortunately, my butter poached lobster was a little overcooked. This little misstep was redeemed in the seared salsify and wilted ramps which added a crisper texture to the dish. The vanilla-flavored foie looked a little lonely all by itself on the top left and at first I did not know how to incorporate that with the other elements. The sharper flavor of the pinot noir paired well with the overall flavor of the dish. Here we go! My favorite pick of the night prepared by Chefs Hiro Sone and Lissa Doumani of Terra and Ame. (Apparently it was also the favorite of EaterLA judge Kat Odell!) Perhaps the most umami tasting dish of the 6 courses, the combination of the forest mushrooms, perfectly cooked tortellonis, and foie gras worked extremely well together. Once you reach the inside of the tortelloni, there is a burst of flavor that we guessed to be truffle. Alice thought this was overwhelming but I wish there was at least one more tortellini! 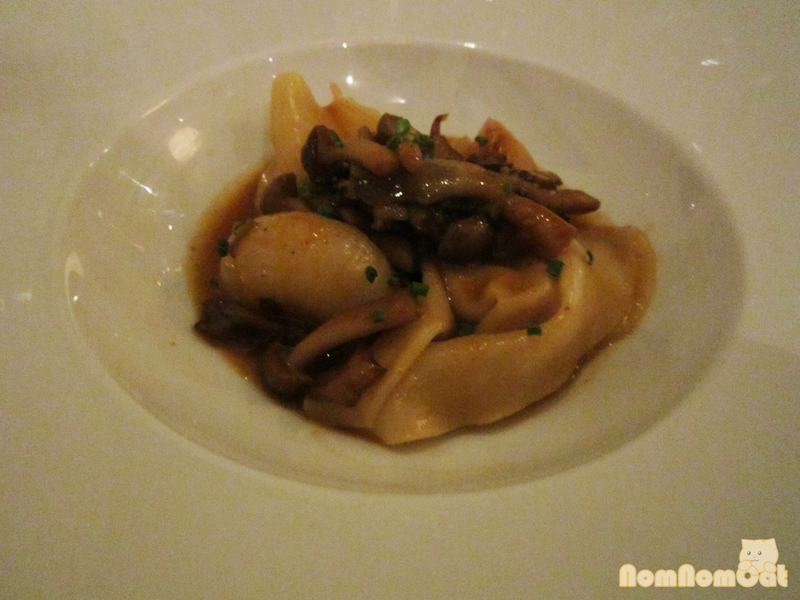 Paired with a younger Pinot Noir than the previous dish, the bold umami flavors from the mushrooms were happily married to the foie tortelloni. The fifth course prepared by Chefs Josiah Citrin and Ken Takayama of Melisse diverged from giving the foie the limelight the entire time. 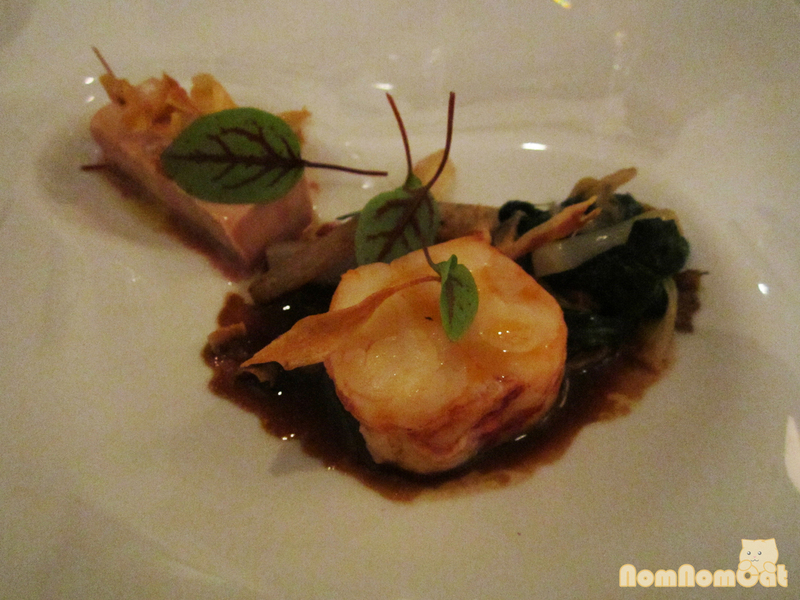 Shaved on top of the dish, the foie gras quickly melted into the landscape of the warm dish. This divergence, however, was very welcomed since by this point we were getting a little overwhelmed with all the buttery too-much-goodness of the foie. The red king salmon was beautifully cooked and paired amazingly with the red wine sauce. Moving into darker territory, the cabernet franc pairing worked well with the salmon but felt redundant with the red wine sauce already making its presence very known on the dish. Intended to be the main dish of the 6 courses, Chef Mark Dommen of One Market prepared a reunion of sorts with the Liberty Farms duck, duck andouille, and artisan foie. Alice and I absolutely loved the Liberty Farms duck slices, juicy and enhanced by the sauce. The duck andouille was a little too spicy for me but Alice thought it was exciting. 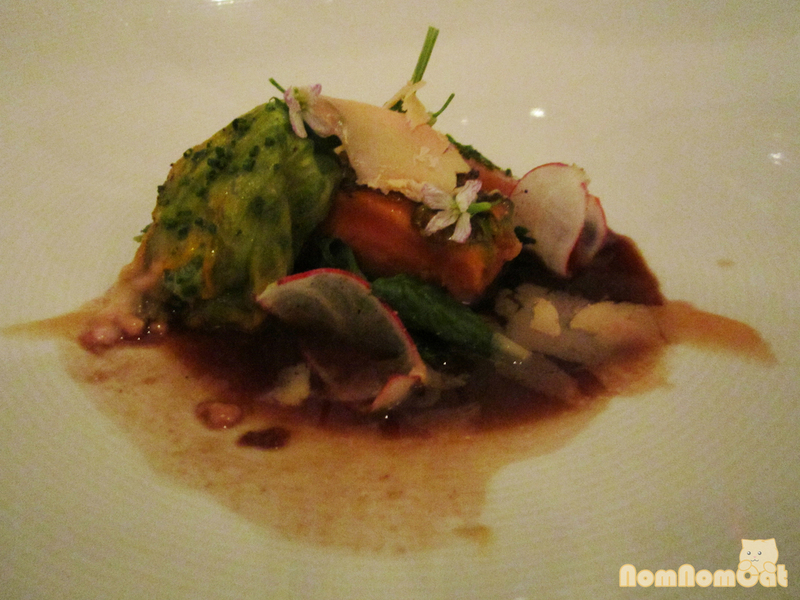 We both liked the celery root puree which highlighted a lighter side of the dish. The artisan foie, to me, was too fatty. It could be perhaps this was a larger serving of foie of the 6 courses and served at the very end. 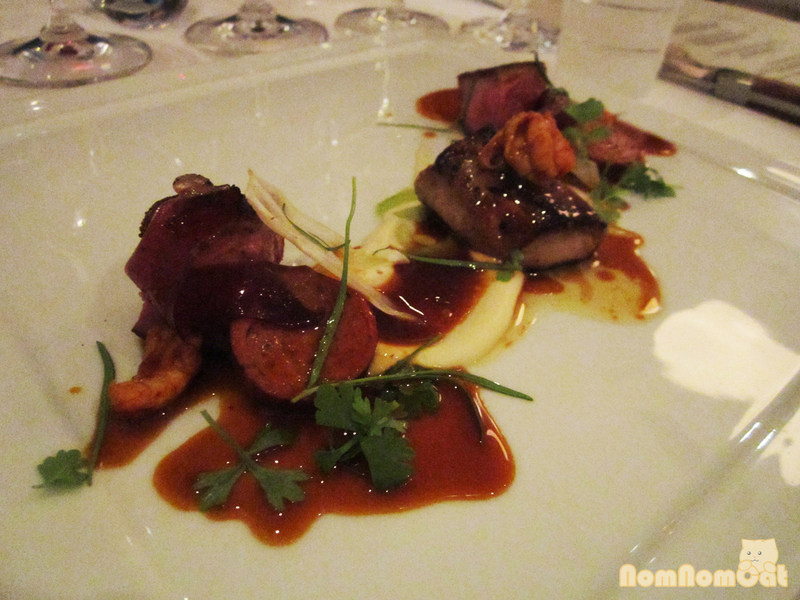 Nevertheless, the various elements of this dish sat side-by-side with a cabernet sauvignon, my favorite of the reds. 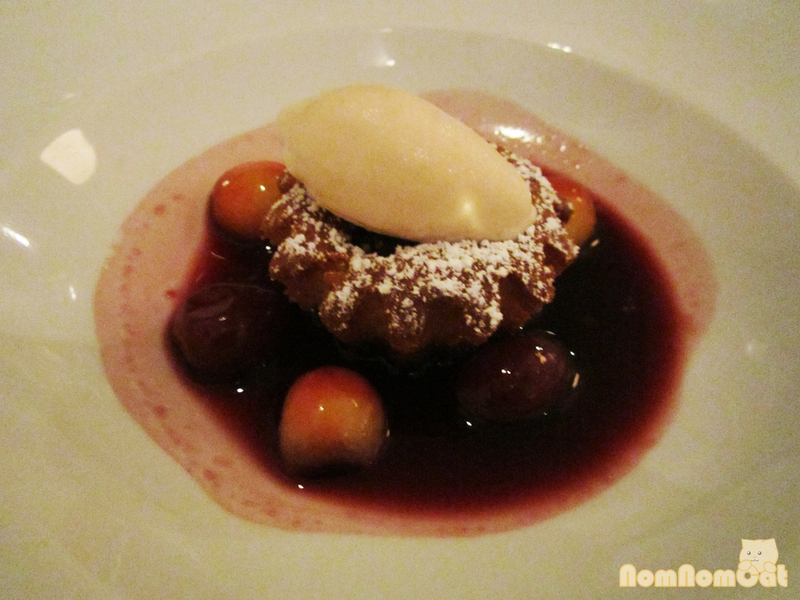 Dessert was a foie butter cake with macerated Murray Farm cherries and foie ice cream. My favorite element of this dish was the foie ice cream. Hell, I would’ve been perfectly happy with just a heftier scoop of it. The cake could also have been more moist but the plentiful sauce and ice cream assisted in balancing the cake. Alice loved the first-of-the-season cherries but they’re just not on my list of favorite dessert ingredients. So we both felt really bad for not being able to finish all 7 glasses of wine (well, other than the Late Harvest – Alice drank both glasses of that!). 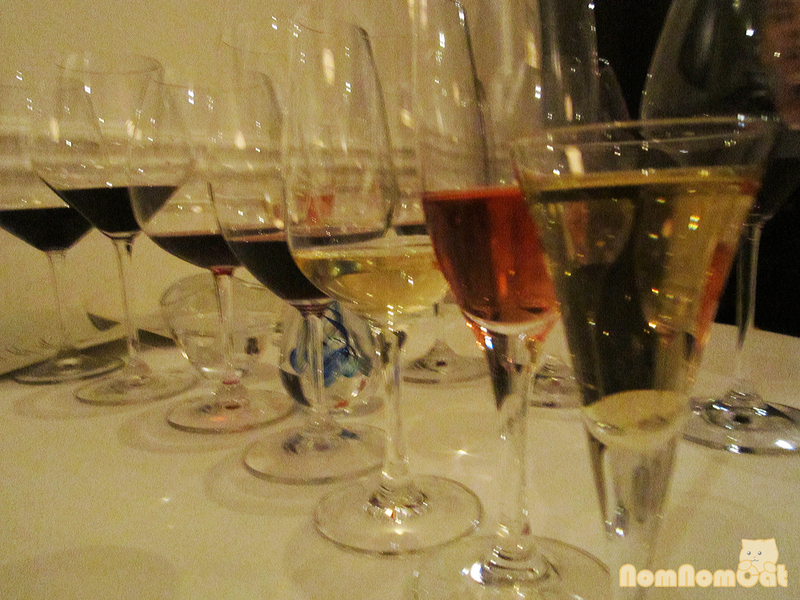 We also didn’t really expect such heavy pours, the 7th glass, or really any wine at all. When we made the RSVP, we had completely overlooked the inclusion of wine pairings with every course. I guess you can say it was a pleasant surprise! 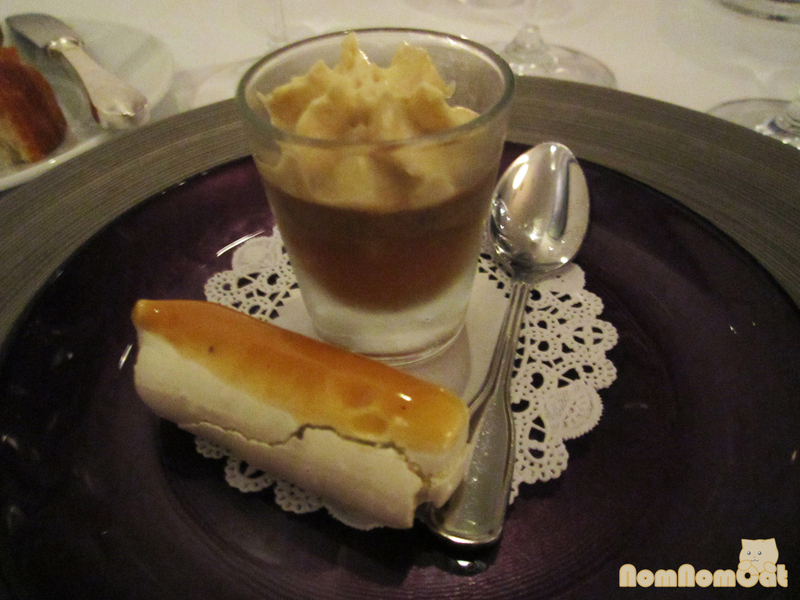 The dinner ends just as small as it began (with the amuse bouches). 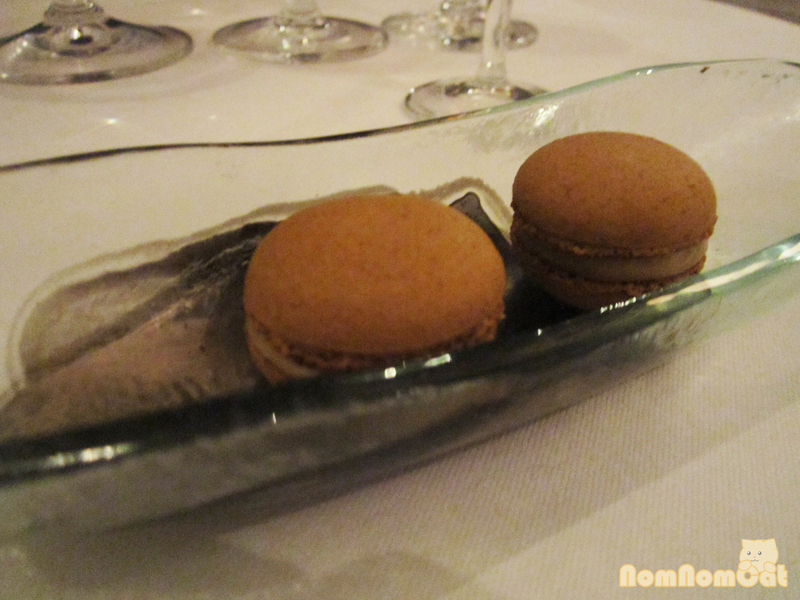 Delicate bite-sized macarons with a fair amount of foie flavor in them. I’m a big fan of the cream filling. We received impeccably friendly and helpful service from Sullivan, who even went back to the kitchen to ask for Chef Collins so we could finally meet him in person! 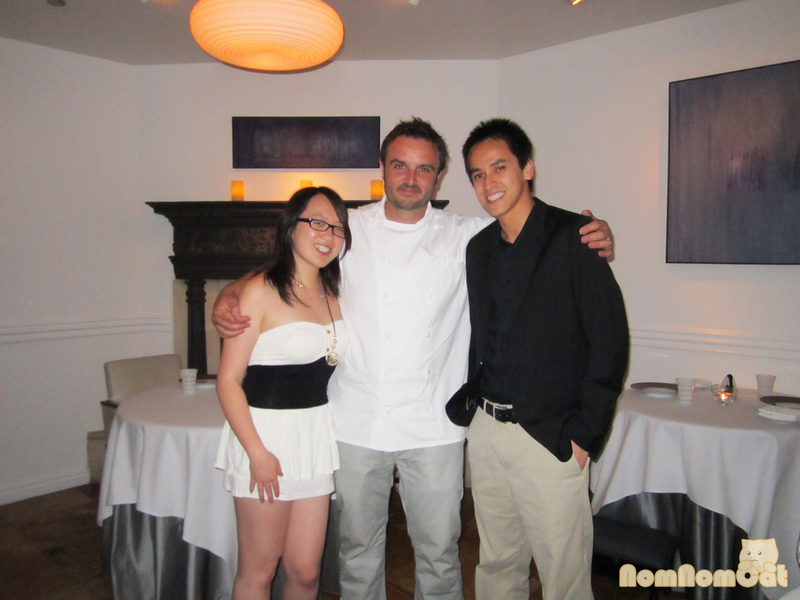 It was a phenomenal opportunity to not only experience dinner at a (well deserved!) two-star Michelin restaurant but also a historic event to celebrate a luxurious and downright tasty ingredient. We would like to thank from the bottom of our hearts all of the chefs and all of the people who made this fantastic event possible (that means you too, Tiffany “from Facebook”!). Here’s to hoping for change between now and July 1st!